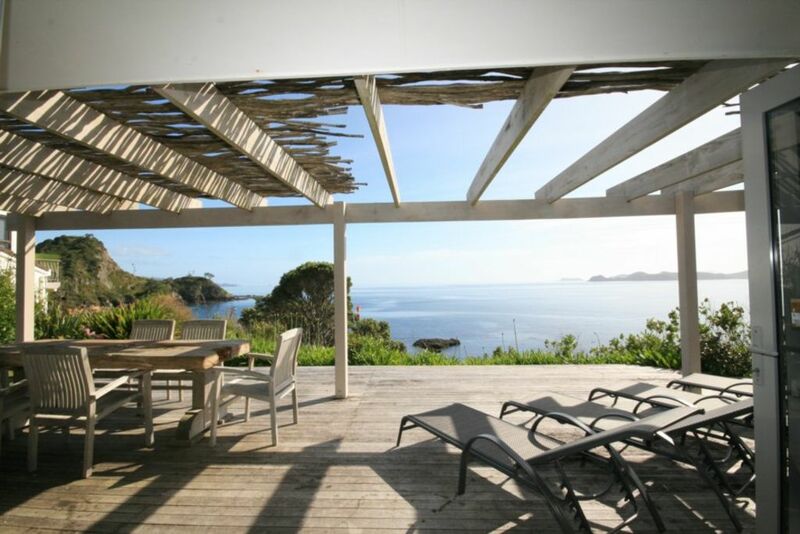 Absolute Ocean frontage with sweeping 180o views out through the heads and to Roberton Island. Enjoy dolphins frolicking right in front of the house and hear the murmurings of the ocean just metres off the deck - paradise found! Open plan all new kitchen and appliances, lounge, dining. This exceptional property will leave you with lasting memories of a truly wonderful holiday. *Please note that we are unable to accept children under the age of 10 years of age and they will need to be supervised by family as the house is located on the waterfront/cliff edge. Safe swimming beaches just 300 metres away. Rock fishing right in front of the house. Snapper for breakfast - almost a certainty! PLEASE NOTE THIS PROPERTY IS NOT SUITABLE FOR A BOAT! The cost for the linen and towel hire is an additional required charge of $35.00 per person. Please note there is a $50.00 booking fee applicable on all bookings. No pets, no smoking inside This property is not suitable for a boat. SPA POOL: There is an additional charge for use of the spa pool of $85.00 per stay. We change the water after each guests stay. Nespresso - bring your own pods - started pods are supplied. The location and view are just incredible, the house itself is very well appointed and comfortable. There is everything you need to have a easy care free holiday, an excellent place to relax and unwind. Perfect spot for relaxing sun sea snorkelling and fishing. Perfect spot for relaxing sun sea snorkelling and fishing. Only wish it was our little secret! Fantastic location with great views. Brought the family over from England and they were blown away by the bach and in particular the view; amazing!! The entertainment for kids, parents (hot tub) was brilliant and the bach came with absolutely everything you could imagine ... when in need, look in the cupboards! Not sure whether cleaning the bach and BBQ etc following staying there was appropriate for the price, but that's life! we loved it and definitely will stay again!